Fall is starting to show itself where I live. The trees are just starting their annual color transformation with their leaves just beginning to show a tint of sun kissed gold. Plus, here and there, a few early leaf droppers are starting to turn orange. When this post goes live on the blog, thanks to the magic of technology, I will be on a camping trip in northern Wisconsin where I get to be outside in the wonderful fall weather for 10 whole days! I just hope the weather is nice and not too stormy and rainy. But today, day 4 of my 5 day series (day 1 was Vermont; day 2 was Michigan, and day 3 was North Carolina) on great fall camping destinations, focuses on a state several hundred miles from northern Wisconsin. It's Georgia, with a focus focus on Vogel State Park and Amicalola Falls State Park. VOGEL STATE PARK Vogel State Park is one of Georgia's most popular state parks and is located at the base of Blood Mountain in the Chattahoochee National Forest. It is a popular fall destination because the trees in the Blue Ridge Mountains turn from a sea of green to a gorgeous vista of reds, oranges, and golds. The park has 103 tent/trailer/rv campsites, 18 walk-in campsites, 35 cottages (3 are dog friendly!) and primitive backpacking campsites. 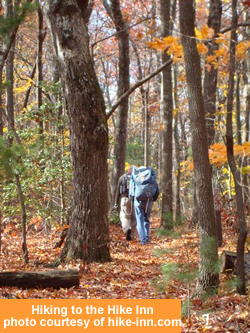 There are 17 miles of hiking and backpacking trails and the 2,174 mile Appalachian Trail is nearby. There are also opportunities for fishing in the park's 22 acre lake and miniature golf. 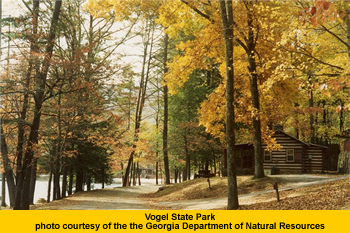 A fall hoedown is taking place at Vogel State Park during its prime fall foliage viewing season. The hoedown is on Saturday October 18, 2008 from 2 pm to 9 pm and will feature hayrides, campfire and dancing, a professional storyteller around a bonfire, with chili and drinks available for purchase. 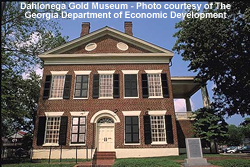 Some of the nearby attractions include the Blue Ridge Mountains and Appalachian Trail I mentioned earlier; the Dahlonega Gold Museum which features an award winning film telling the story of the beginning of the gold rush in North Georgia along with exhibits that include a large hydraulic cannon and nozzle that was used to blast soil from mountainsides; and the Cabbage Patch Kids Babyland General Hospital where they are celebrating their 25th anniversary (remember when Cabbage Patch Kids were so popular that people were fighting over them in the stores?). 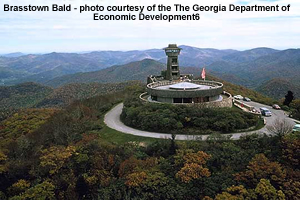 If being up as high as possible without leaving the ground is your idea of fun, visit Brasstown Bald Mountain, which is the highest point in Georgia at 4,784 feet above sea level. It's less than an hour's drive from Vogel State Park and on clear days you can see 4 states (Georgia, Tennessee, North Carolina, and South Carolina) from the top of the mountain. And, if you're looking for a nice scenic drive to take while in the area, drive the Richard Russell Scenic Highway - Highway 515. It's a 40.6 mile drive that the NSBP (National Scenic Byways Program) suggests allowing three hours to enjoy. Plus there are ample opportunities for antiquing in the area plus, fall festivals, rafting, fishing, and golf. 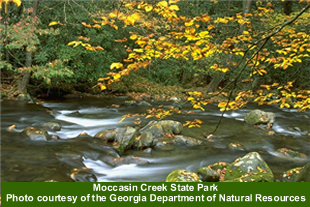 Other nearby state parks include Moccasin Creek State Park (55 tent/trailer/rv campsites, wheelchair accessible fishing pier, lake fishing, 1 mile interpretive trail, and 2 mile Hemlock Falls hiking trail); and Unicoi State Park and Lodge (82 tent/trailer/rv campsites, 34 walk-in campsites, squirrel's nest camping shelters, 30 cottages, tennis courts, hiking, biking, and fishing) are also nearby. AMICALOLA FALLS STATE PARK Amicalola Falls State Park is another popular Georgia State Park and is less than 50 miles from Vogel State Park, so you could split your trip into two segments and camp at both parks. 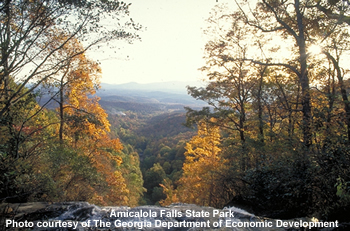 At 729 feet tall, Amicalola Falls State park has the tallest cascading waterfall east of the Mississippi River (pretty easy to figure out how the park got its name isn't it? ); gorgeous views; 12 miles of hiking trails; trout fishing; great scenery for "shutter bugs;" and several lodging options with 24 campsites, 14 cottages, 56 lodge rooms, and the unique Hike Inn. 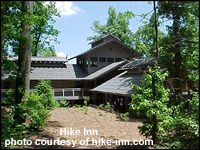 What is the Hike Inn? I wondered that too. It combines getting out into the wilderness and hiking with having creature comforts like soft beds, hot showers, and a family style meals you don't have to cook! That means no lugging of food and sleeping gear while on your hike. All you need to bring is water to drink while on the trail, clothing and socks, hiking boots, rain gear, toiletries, sunscreen, insect repellent, a first aid kit and a flashlight - things that you'll either be wearing or able to fit in a normal sized backpack. And, if you don't mind heading there after the color has peaked, consider visiting the park for their Appalachian Thanksgiving on Thursday November 27, 2008 for a traditional Thanksgiving buffet with Appalachian cultural demonstrations, or visit them on Saturday December 6, 2008 for their Christmas Open House where there will be choir performances, gingerbread houses on display, winter hayrides, and visits with Santa! FOLIAGE REPORTS Peak fall foliage viewing in north Georgia where Vogel State Park and Amicalola Falls are located is typically from October 15 to October 31, but check the fall foliage report for the area to see for yourself what the color is like before heading there to avoid disappointment like I experienced several years ago when I planned a visit to Vermont but ended missing the best color for that year by a week. Fall color updates for Georgia and the rest of the United States can also be obtained by calling the National Forest fall color hotline at 1.800.354.4595 or by visiting their webpage. Quote from Elizabeth Lawrence (writer and garden designer born in Marietta, Georgia in 1904) "Everyone must take time to sit and watch the leaves turn."